Welcome to my shop! I have 7 years of experience making handmade camera straps and stethoscope covers with over 3000 5 star reviews ⭐️⭐️⭐️⭐️⭐️! Order with me and you won’t be disappointed! This adorable camera strap cover is a stylish, comfortable, and practical way to personalize your camera! It has been padded on the minky side for your comfort. 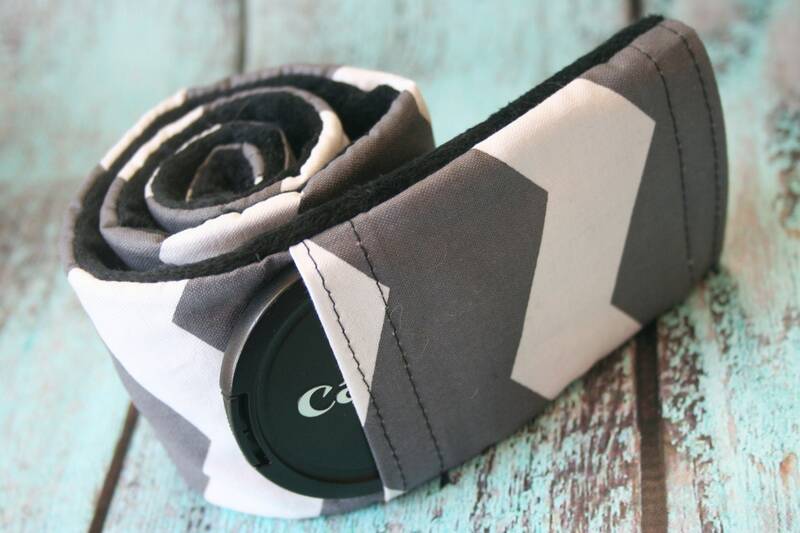 I have also added a small pocket for your removable lens cap! It's the perfect photography accessory!! The cover measures at 2.5” x 25” and is perfect for covering your Canon or Nikon straps. However, please measure your strap to ensure perfect fit. Should you need a special order size just let me know before ordering and I will create a custom listing for you! Pattern position may vary slightly. What makes Paisley Maizie different? ♥ SUPER Soft fleece padding - holds its shape! ♥ Quality cotton fabrics, nothing cheap here! My products are lovingly made in a smoke free home. Perfect I love it.Can't wait to really use it. this strap was for my sister-in-law for her Nikon Camera. She loves the strap cover. great quality. as pictured. it adds great comfort (even though she is just a casual photographer) . My daughter absolutely loved her gift! She said her camera strap feels so much more comfortable around her neck. Items that are not personalized in any way MAY be eligible for return, please message me to discuss a return. Paisley Maizie reserves the right to reproduce custom made items. We also reserve the right to photograph all items we create and may use them at our discretion for advertising or as samples inside our listings. All photos of completed work are the property of Paisley Maizie and cannot be used without our permission. Thank you for your interest, however, I do not currently have the ability to give wholesale pricing.